This is the latest evolution of the Supertouring seat. It features the same high-side containment shape and lateral support found in the Suzuka with the addition of an integrated head restraint. The Evolution is also outfitted with Cobras independent leg support system (split cushion) for maximum driver support and agility, and anti-wear patches for hard-wearing good looks. Kevlar construction makes this seat 30% lighter and infinitely stronger than similar fiberglass seats. Available in Regular or Wide "GT" width. Two seats will ship for a discounted price, please call to order. 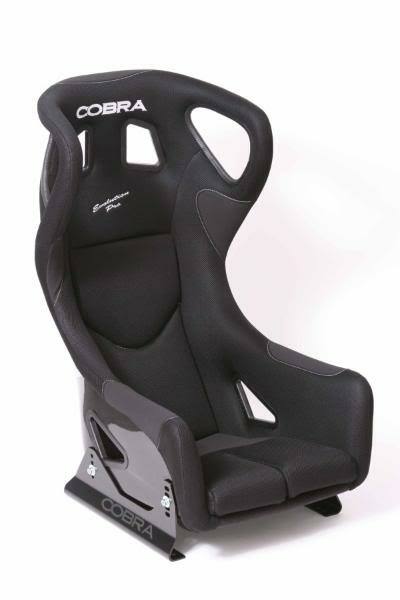 You may pickup most Cobra seats at our location in Philadelphia, PA on request. Sorry, seats are not eligible for free shipping, or shipping promotions.